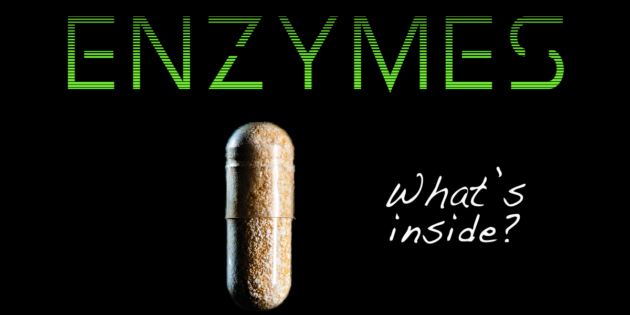 So what are Digestive Enzymes? 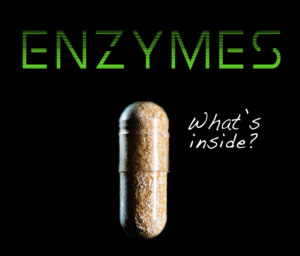 Digestive enzymes are biologically active proteins that convert food into small molecules so that it can be absorbed into your system and feed your cells. The foundation for health and recovery from illness rests in the ability of our digestive systems to digest food. All of the nutrients necessary to sustain life reside in the food we eat. After you chew your food, enzymes in different parts of your digestive tract, convert the food into simple sugars, fatty acids, glycerol and amino acids. Our bodies produce enzymes specific to the type of food we are eating. The 3 most important enzymes in this process are protease, lipase and amylase. Protease digests the protein, lipase digests the fat and amylase digests the carbohydrates. All the animals in the wild eat everything fresh. They eat nothing cooked. 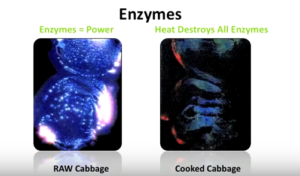 So when we eat cooked food (that has no enzyme activity) the body has to use up more of its own enzymes than it can manufacture to digest the food. This causes the body to become enzyme deficient over time. When this happens you can end up with partial digestion. When you have an accumulation of undigested proteins, carbs, and fats, they putrefy, solidify, and ferment inside the body which can then attract parasites, viruses, bacteria and yeast and lead to toxemia. When you eat fresh foods in its natural state, you are taking life into your body. Plant-based organic raw living foods are already bio-available to your cells. This way you get all the protein amino acids, fatty acids, the glucose, the phytonutrients antioxidants, vitamin and minerals at a cellular level. The body easily recognizes these micro-nutrients and absorbs into the cells so you can manufacture metabolic enzymes and maintain cellular integrity. Dr. Edward Howell, a medical doctor, and scientist did a study on the longest living people in the world and observed that they ate only fresh plant-based enzyme-enriched foods. He also discovered that they never got sick. He said, "Enzymes are the missing link for radiant health and longevity. A lack of enzymes is fundamentally responsible for ill health". So even if you're still eating cooked foods, you will want to take enzymes with your meals. We have learned so much about enzyme therapy. The power of plant-based enzymes in a concentrated form can be used to accelerate the cleansing and healing process. You can use them to put the enzymes back in the food that was cooked out of it to help you compensate and take the stress off of your pancreas. Of course, the ultimate lifestyle is eating mostly fresh live foods from enzyme enriched soil, then you don't really need them. But if you're not doing that or you can't do that right now... you can use Liyfzyme to put the life back in your food. These are of the highest quality, broadest spectrum of 16 different kinds of enzymes, using whole food co-factors. Lou Corona has made them available through Puradyme. Lou Corona has done a lifetime of research to create the most highly activated enzymes in the world. Lou says, that while you're on the path to evolving, you will want to take high activated enzymes like Liyfzyme right before your meal so that it can put the life back in your food. Most people take about 4-5 just before they eat. You will be running, clean and efficient with an abundance of energy. Learn more and get yourself on a path to health, wellness, and longevity. It's the Life in your food.